It’s a bit early to start cleaning out the pantry, refrigerator and freezer for Pesach but, with that mega chore in front of me I’ve decide to concentrate on using up all the bread as quickly as possible so that, in the interest of getting a jump on using up the bits and pieces of left over challah that are stockpiled in my freezer (we all have them, just waiting to be turned into breadcrumbs) I’m going to suggest everyone join me in making grilled cheese sandwiches. You know the basics you’ll need, bread, cheese, butter but, as always I say, why make the same old same old sandwich. Mix it up and if you’re in a really creative mood you can invent your own personal new favorite. If you’re adding fresh uncooked or cooked veggies you may want to toast the bread just a bit before making your sandwich. This will keep it from getting soggy. You can use either salted or unsalted butter and the jury is still out on whether it’s better to butter the bread before cooking or melt the butter in the pan and then cook, your choice. The type of bread can vary depending on if you’re in the mood for a hearty multi-grain, a crunchy Italian or French or the ever popular challah. I prefer to slice my own slices, just a bit on the thicker side but be warned, the thicker the slice of bread the longer it will take for the cheese in the middle of the sandwich to melt. The cheese choice is TOTALLY up to your personal preference and taste. The most popular pick is cheddar or American and Colby. I’ve also used Monterrey Jack, Pepper Jack and Swiss but seriously, use what you like or have, almost all will work but be careful, harder cheeses like Parmesan, Feta, Gouda or even Blue Cheese do not melt the same way as the cheddar and the other softer cheeses do. The butter and cheese should be at room temperature before you start. Sprinkle a pinch of garlic powder or salt on the buttered side of the bread before cooking for a little bit of extra flavor. If you’re adding vegetables don’t put them next to the bread, they will make it soggy, sandwich them between 2 layers of cheese. 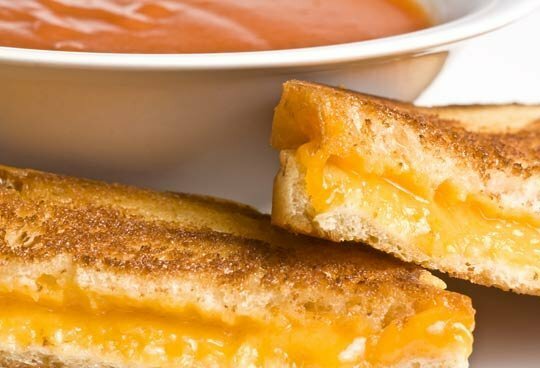 MY FAVORITE: Using caramelized onions or adding avocado to any grilled cheese sandwich is genius! Heat a skillet and then brush one side of the slices of bread with the oil and sprinkle the parmesan cheese on top of the oiled side of the bread. Place the slices, oil side down, in the pan and then place the slices of cheese on the slices of bread. Spread the pesto on 2 of the sandwiches and then place the tomato slices on top of the pesto. Cook for 2 minutes then, with a spatula, flip the slices of bread with just the cheese on it on top of the slices with the tomato. Cook for another minutes and serve. If the cheese has not melted to the consistency you want it to be you can stick the sandwiches in the microwave for about 10 seconds. Makes 2. In a skillet melt 2 tablespoons of butter. Add the sliced apple, brown sugar and cinnamon. Cook, stirring occasionally for 4 to 5 minutes, just until the apple slices start to soften. Remove the apples from the pan but don’t clean it out. Melt 1 tablespoons of butter in the pan place 2 slices of bread on it. Divide the apple between the 2 pieces of bread in the skillet. Spread the remaining tablespoon of butter on one side of the remaining pieces of bread and place them, buttered side up on top of the cheese. Cook for 2 to 3 minutes then, using a spatula, gently flip the sandwich over. Cook an additional 2 to 3 minutes until the 2nd side is golden. Serve immediately, Makes 2. Preheat oven to 425. Lightly toast the challah slices and set them aside. In a bowl combine the eggs, milk and salt and pepper. Whisk to combine and set the mixture aside. In a skillet heat the olive oil then add the olive oil, black beans, green onions and jalapeno, if using, to the skillet. Saute for a 3 minutes, stirring occasionally. Add the eggs and cook, stirring to combine, just until the mixture starts to set, 2 to 3 minutes at most. Place the toasted challah slices on a cookie sheet. Divide the egg mixture between them and then top with the cheeses. Bake just until the cheese starts to bubble and brown. Serve immediately with salsa. Makes 8 Serves 4. In a large skillet heat the olive oil and then add the garlic. Cook for 1 minute, stirring constantly and then add the bell pepper slices. Cook 1 minute, stirring constantly then add the shredded Brussel Sprouts. Cook, stirring constantly so they don’t burn for about 5 minutes. They will be soft and starting to brown. Remove the mixture from the pan, put it into a bowl and drizzle the balsamic vinegar over the top. Mix to coat and set it aside. Butter one side of each of the bread slices. Place 4 slices in the pan and then divide the Brussel sprout mixture between them. Top with the remaining slice of bread (buttered side up) and cook over a medium low heat until the first side is golden and the cheese has started to melt. 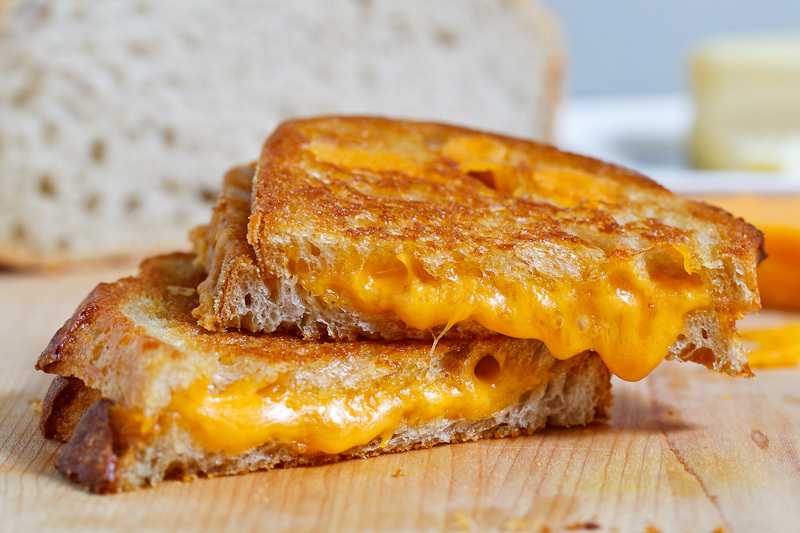 Using a spatula, gently flip the sandwich over and cook until the second side is golden. Place each sandwich on a plate, wait at least 1 minute before trying to cut it in half (if you’re a cut in half type of person) in order for the cheese to cool slightly and set enough so that it doesn’t run all over the place. Makes 4.